Police have made several arrests after drug raids in Sussex this week. Detectives carried out warrants on Monday (April 23) and arrested a 17-year-old boy in Hawkhurst Road and a 24-year-old man in Park Crescent, Brighton, on suspicion of conspiracy to supply crack cocaine and heroin, both Class A drugs. Police said an 18-year-old man was also arrested on suspicion of conspiracy to supply Class A drugs - crack cocaine and heroin on Tuesday (April 24). The move was part of an ongoing operation to target 'County Lines' groups who sell class A drugs,Sussex Police said. Officers added that since March this year 32 people have been arrested who have allegedly been involved in running these lines. Police said Adedoyin Balogun, 24, of Park Crescent, Brighton, and a 17-year-old boy who cannot be named for legal reasons were charged with being concerned in the supply of heroin and crack cocaine and appeared at Brighton Magistrates’ Court on Tuesday (April 24). 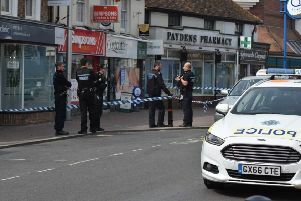 Balogun was remanded in custody and the 17-year-old was released on court bail to appear at Lewes Crown Court on May 22. Zak El Alami, 18, of no fixed address was charged with being concerned in the supply of heroin and crack cocaine and due to appear at Brighton Magistrates' Court on Wednesday (April 25), according to police. A Sussex Police spokesperson said: "The 'County Lines' groups tend to use a local property, generally belonging to a vulnerable person, sometimes drug users, as a base for their activities. This is known as 'cuckoooing' and will often happen by force or coercion. In some instances victims have left their homes in fear of violence. "They establish and operate distinctive telephone numbers for customers ordering drugs, operated from outside the area, which become their ‘brand’. Unlike other criminal activities where telephone numbers are changed on a regular basis, these telephone numbers have value so are maintained and protected. "Sussex Police, working with the Metropolitan Police and the Home Office, are the first force in the country to use a new law aimed at curbing the use of phone lines by organised crime groups to distribute drugs. "This latest arrest phase has resulted in the closure of five dedicated phone lines used by alleged dealers targeting users in Brighton and Hove." Detective Inspector Julie Wakeford from the Brighton and Hove Community Investigation Team said: "Many of the supply networks targeted through this operation originate from various boroughs within London. "We had support from the Metropolitan police throughout this operation and will continue to work with them to disrupt these networks often linked to London gangs who are intent on supplying heroin in Brighton and Hove. "The methods they use to operate their dealing networks exploit vulnerable people both adults and teenagers in order to maximise their profit from drug supply. "The team works hard with our partners to reduce the harm caused by these dealing networks and to safeguard the vulnerable people exploited by them . We share a commitment to reduce the harm associated to heroin and crack cocaine supply in the city." For advice and information about drugs see the Sussex Police drug advice page.